Fort Drum, New York. 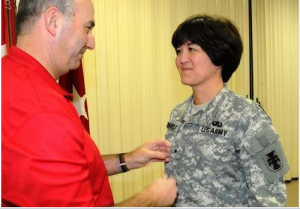 Colonel Miyako N. Schanely, USAR, was promoted to Brigadier General in the Army Engineer Corps in December 2013 at a ceremony at the 412th Theater Engineer Command’s headquarters in Vicksburg, Mississippi, where she serves as Deputy Commander. This was followed by a pin-on ceremony at Fort Drum, New York, on January 4, 2014. General Schanely is the second Japanese American woman in the armed forces to reach flag rank, the first being Major General Susan Mashiko, USAF, (Ret) , former Deputy Director of the National Reconnaissance Office (NRO), Chantilly, Virginia. Schanely told Watertown Daily Times (New York) staff writer, Gordon Block, in a January 7, 2014 article, “It’s absolutely an honor,” to receive this recognition and hope this will pave the way for more women to be promoted to flag rank. Schanely’s stepfather, Harry Harushi Tanabe, an Army warrant officer, performed counterintelligence work in the Pacific during World War II as the rest of his family was forced into an internment camp. “We’re just incredibly proud of him and his whole generation that went through that,” General Schanely said. After graduating from the U.S. Military Academy at West Point in 1986, General Schanely served seven years of active duty, which included construction work in Germany and humanitarian efforts in Panama, before transitioning to the U.S. Army Reserve in 1993. In the more than 20 years in the reserves, she has served in units at stateside installations such as Fort Drum, New York, and Fort Dix, New Jersey. Her overseas assignments included Riyadh, Saudi Arabia, and humanitarian missions in Panama, Uruguay, Belize and Honduras. BG Schanely holds a Bachelor of Science in Engineering Management from West Point, a Master of Business Administration from the University of Rochester, a Master of Arts in Community Economic Development from Southern New Hampshire University, and a Master of Strategic Studies from the United States Army War College. Her career awards include the Legion of Merit, Meritorious Service Medal with Silver Oak Leaf Cluster, the Army Commendation Medal with Silver and Bronze Oak Leaf Clusters, the Army Achievement Medal, the Parachutist Badge and the Jungle Expert Badge. In her civilian role, as the Executive Director of the State University of New York (SUNY) North Country Consortium, General Schanely oversees a partnership of SUNY campuses bringing a variety of degree programs to the Northern New York area. With her husband, Steve, she resides in Black River, New York, and has two grown children. BG Schanely’s mother, Miyako Tanabe, who was born in Honokaa, Hawaii, resides in Waldorf, Maryland. She served in the US Air Force with the rank of Captain. Both mother and daughter are life members of JAVA.